Are IAQ (Indoor Air Quality) and IEQ (Indoor Environmental Quality) the same thing? Many people confuse the two, but they are different (although overlapping) concepts. Indoor Environmental Quality (IEQ) is most simply described as the conditions inside a building. It does not refer to the air quality alone, but the entire environmental quality of a space, which includes air quality, access to daylight and views, pleasant acoustic conditions, and occupant control over lighting and thermal comfort. Americans spend a majority of their time indoors; not surprisingly, studies have shown an increase in worker productivity when improvements are made to a space’s IEQ. Building managers and operators can increase the satisfaction of building occupants by including thoughtful IEQ details in the design and operation of a space. IAQ is a subset of IEQ. 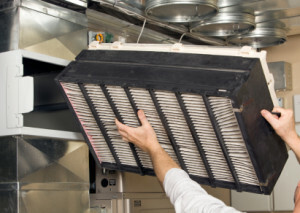 Indoor Air Quality focuses on, not surprisingly, air. IAQ is a measure of the building’s interior air in terms of the occupant’s potential health and comfort. Chemical, physical, and biological (mold & bacteria) contaminants can cause symptoms ranging from discomfort to serious illness. Potential contaminants can include dust, cigarette smoke, carbon dioxide, carbon monoxide, ozone, radon, VOCs (volatile organic compounds), and various other chemical compounds from off gassing of building materials and cleaning supplies. Careful selection of building materials and cleaning agents, as well as having air filters and sufficient ventilation increases air quality. In short, IAQ is about what we breathe. IEQ, more comprehensively, is about what we breathe, see, hear, and feel inside a building. The staff at Greenpoint is licensed certified and ready to assist our clients. We will discuss your complaints or concerns with you and tailor a plan of action to address you’re specific needs. There’s no “one size fits all” approach at Greenpoint.